Shady Lane Oaks is an age-qualified adult community of 250 homes sites. Nestled beneath sprawling mature oak and pine trees that whisper in the wind, Shady Lane Oaks provides a peaceful feeling of home and serenity. 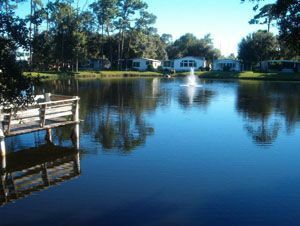 As you walk under the large trees to one of the many activities at the clubhouse, shuffleboard courts, heated pool, or just to stand and feed the fish and large turtles on the dock at our beautiful lake, you’ll be glad you chose Shady Lane Oaks. Shady Lane Oaks is located between Tampa Bay and the Gulf of Mexico in the city of Clearwater, a tropical paradise that is part of Pinellas County. Known as a great spot to get away, it's an even better place to live. Clearwater residents are friendly and the area is rich in culture. Shady Lane Oaks is near public transportation, shopping, fine dining, sports facilities, golf courses, medical facilities and is just minutes away from the airport. Downtown is also nearby, where you’ll find the gateway to beautiful beaches.